• Can children come less than 5 days a week 3 hours a day? • What about 3 or 3½ year-olds? • What about my 8 or 9 year old? Do you have classes for older children? • Do children get confused learning a 2nd language at a young age? • Will learning a second language put them behind in school? • I speak fluent Spanish, but I haven’t had great success teaching my kids. How do other parents do? • If my older child attends only the summer session, is that enough to be worthwhile? • What qualifications do the teachers have? • Do you do background checks? • My child is bored with his other preschool because he already knows most of what is taught. Will he do okay in Spanish classes? • So once my children learn Spanish, how do they retain it? How do we keep them from forgetting everything they learned? 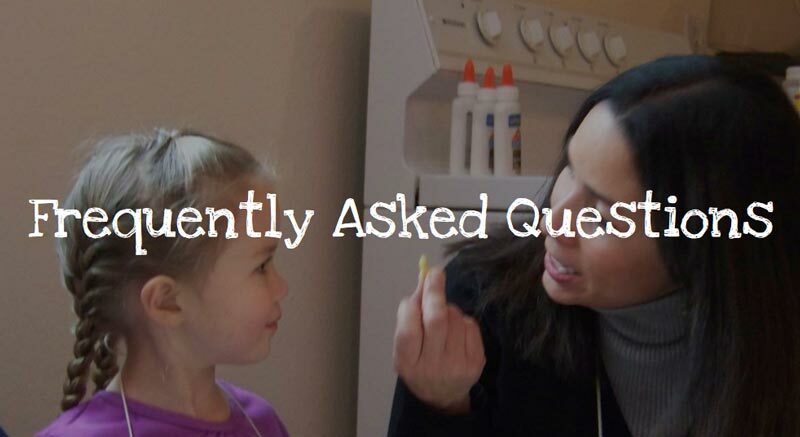 • What kind of results can we realistically expect from 3-5 year old children? • Are there any discounts for more than one child in the program? • Isn’t 3 hours 5 days a week too much? I don’t want to over-program my child. • Do you teach other languages beside Spanish? • Is the transition to an all-Spanish environment difficult for children? • Can I enroll my child in the 3-day/week option if it is his first year? Can children come less than 5 days a week 3 hours a day? 3 days a week is possible, but we don’t recommend it except for children who are in their 2nd year in the program, or who they already have a solid background in Spanish. We’ve tried to do less than 5 days a week and 3 hours a day and for many children it isn't enough practice in the language to really catch on. Since everything is in Spanish every day, if they don’t catch on, it becomes frustrating for the children to come every day and not be able to communicate. We do a 3-day option in the summer, for children who are trying the McKee Schools and for those who simply want to retain Spanish. What about 3 or 3½ year-olds? Every child is different. As long as they can stay focused and participate in the activity younger children can do well in the program. Most 3½ year-olds do okay. Many 3-year-olds do well. It depends on their personality, experience with other preschool settings, and other factors. If you have a 3-year old, have them come and try it out for a day. After a short time it is usually pretty clear how they will do. If they participate in the activities and enjoy it, then they will be able to do well with the Spanish program. If they have trouble staying in the activity then you can always have them try again the next term. What about my 8 or 9 year old? Do you have classes for older children? The method works with older children as well as younger. The reason we have mostly younger children is because older children usually don’t have 3 hours a day devote to Spanish in addition to the five or more hours they are in school. Children who are in kindergarten or even first grade seem to be able to manage well if they participate in the program and spend a half-day in regular school. Do children get confused learning a 2nd language at a young age? No. Children learning a second language become confused if the people speaking with them mix the language, by using Spanish and English in one sentence. The child can’t understand which words and rules go with which language. Our classes are 100% Spanish so there is no confusion that takes place. See our Additional Resources page for links to research that has consistently shown that in the right environment, no confusion takes place. Will learning a second language put them behind in school? Research has shown that children who learn a 2nd language actually do better in school—in language arts, creativity, cultural awareness, even standardized tests. Immersion programs have been around for decades and there has been a lot of research done on this question. (See links to research here.) Research consistently concludes that learning a 2nd language does not put children behind in their first language (English) and there is a good body of research that shows a correlation between children who learn a second language and higher performance in other subjects. There are actually not many things in school that aren’t related to language processing, and learning a 2nd language increases the child's language processing abilities, which in turn improves their performance in school. I speak fluent Spanish, but I haven’t had great success teaching my kids. How do other parents do? No matter what method is used, or who is learning, learning a foreign language takes a lot of time and practice using the language. Some parents have great success passing a language onto their children, but most struggle. Many children rebel against their parents speaking to them--they don't want to have anything to do with that language. Other children adopt an approach of "you speak your language and I'll speak mine"--they listen and understand when their parents speak Spanish, but they respond in English and don't learn to speak Spanish themselves. In other situations, parents simply can't devote enough time interacting with the children for them to learn more than a couple of words. Children can learn the language well, but they need a lot of time interacting in the language, fun activities, friends that speak the language, and an environment where only Spanish is spoken. Most parents have a hard time providing all of those for their children. McKee Language Schools provides each of those components for your children along with a proven method. If my older child attends only the summer session, is that enough to be worthwhile? It takes about 500 hours for the children to become functionally competent. A full 5-day a week summer session provides between 100 and 150 hours in Spanish. So most children won't become fluent in Spanish during a summer program alone, but they will definitely get a good foundation. Most children will learn hundreds of words, simple sentence formation, pronunciation, and listening skills. Most importantly, the summer session provides enough for children to overcome the fear of speaking in Spanish. Older children that attend during the summer can attend after school classes a couple times a week during the school year. After school classes generally start at 3:45 or 4:00 (check your school's schedule) and last for 2 to 2.5 hours twice a week. Teachers are native speakers, and must become certified in McKee Language Systems, our method for teaching children a language. Because of our unique way of teaching, we qualify the teachers ourselves. All of our teachers love working with children and most of them have backgrounds in education or childcare. We do background checks on all teachers before hiring them. My child is bored with his other preschool because he already knows most of what is taught. Will he do okay in Spanish classes? That’s the main reason most of our parents put their children in our program. Often, their children are already familiar what is being taught in preschool--either from home or time already spent in a normal preschool--and they need more of a challenge. There’s no better time to learn the language than when they are young, so why not have them be in preschool, and also become bi-lingual? So once the children learn Spanish, how do they retain it? How do we keep them from forgetting everything they learned? In the second or third year of the program (depending on their age when they start) we teach the children how to read in Spanish and then we have a program that will take them through to junior high level learning Spanish from regular school textbooks in Spanish (not books for Spanish learners, but for children who are native Spanish speakers). The time required is much less than in the beginning levels--just two times a week for a couple hours. Then in Junior high there are other opportunities through school to keep up on their Spanish. Salt Lake, Alpine, and several other Utah districts have elementary and junior high schools with dual immersion programs. What kind of results can we realistically expect from 3-5 year old children? The results are really remarkable. Children actually become bi-lingual. In the first few weeks they start singing songs and saying simple sentences. Over the next several months they learn ways to express each of 23 “Basic Mobilizing Concepts”—practical concepts children need to be able to express to become mobile in the language. All of the learning is done in an atmosphere of fun and play—the children won’t even know what a Basic Mobilizing Concept is, but they will be able to express them in Spanish. First graders and older children in the second year of the program continue to learn the basics of the language, and also begin to learn how to read in Spanish. In the third and later year—generally before the end of 1st grade--children are functionally fluent in the language and study from Spanish textbooks used in public school systems. Are there any discounts for more than one child in the program? Yes, there is a $50/month discount for the second of two children who are siblings in the 5-day a week beginning program. Isn’t 3 hours 5 days a week too much? I don’t want to over-program my child? During Spanish classes children play in fun activities. They sing songs, play games and sports, make snacks, and make fun arts and crafts. It's different from activities at school. And it only takes about a year for children to get to the point where they can progress in the language coming to classes three and even two days a week. Unlike other long-term skill programs which require more time and expense as the child advances in the skill, language learning takes less time and costs less the longer your children are participate. By 2nd or 3rd grade children can retain their Spanish abilities coming to class just twice a week for 2-2.5 hours each session and are able to retain their Spanish ability. Is the transition to an all-Spanish environment difficult for children? When children first enroll in the program, the transition to an all-Spanish environment can be challenging even though the activities are fun and children enjoy participating. After the initial novelty wears off, it usually takes 4-8 weeks, depending on the child's personality and experience for children to learn enough Spanish to feel at home in an all-Spanish environment. During this period children have a great time every day in the Spanish school, but will resist coming to Spanish school. Once they arrive and start participating each day, they enjoy the activities, and at pick-up time they are usually excited to talk about what happened. But then the next day they resist going to Spanish school. Can I enroll my child in the 3-day/week option if it is his/her first year? If a child enrolls in the 3-day option, the transition to an all-Spanish environment (see above) may take twice as long, or 2-4 months. Because that period is so long for a young child, occasionally a child may give up on ever feeling comfortable at the Spanish school and continue to resist even after they have enough Spanish to feel comfortable. Do the teachers speak English with the children? All classes are taught by native Spanish speakers trained to teach using the McKee Language Systems methodology. All teachers also speak English (most of them are fluent in English), but will not speak to the children in English except where the safety and security of the child requires it, or to clarify rules and expectations in a situation where a non-teaching staff member is not available to speak with the child.